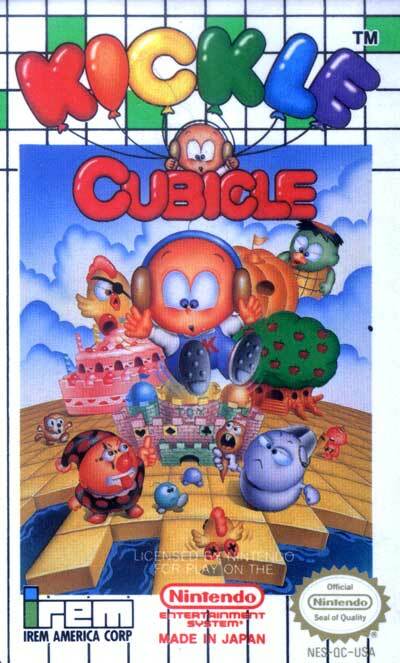 The gameplay of Kickle Cubicle is very similar to the Adventures of Lolo puzzle series. Kickle has ice-cold breath which can freeze some enemies into ice blocks. The resulting ice blocks can then be kicked across the screen to solve puzzles. Kickle can also create ice pillars which can be used as stoppers to further manipulate the direction of the ice blocks, or alternatively to trap enemies. There are four worlds (Garden Land, Fruit Land, Cake Land and Toy Land); each of which contains numerous boards, a boss, and a princess to be rescued. The object of the game is to avoid touching a variety of different enemies and hazards, meanwhile making ice cubes out of enemies and using functional objects (such as hammers and springs) in order to fill holes in the ice, create bridges and paths, and collect all of the red "dream bags" on each board.